Nearly all of the trade signals here share a common story being told with Composite Index and the Stochastic RSI: Extended oversold conditions in the Stochastic RSI and bullish divergence between price and the Composite Index. It is important to remember that oversold and overbought conditions do not always mean that prices are going to experience an impending reversal but if we combine market geometry and these oscillators, we get to see the earliest indications of an impending change. While geometric charting is a leading indicator and shows the path an instrument will take, the lagging indicators (Composite Index and Stochastic RSI) only tell us what already happened. However, when a divergence appears and lasts for a period of days, the lagging indicators turn into leading indicators. And that is the kind of scenario we are in right now. Price is currently above the 5×1 angle and has formed a double bottom on the daily (some may call it a tweezer bottom). A break above the middle harmonic of 12.64 would provide the confirmation needed for an extended run from this value area. Over the last 8 trading days, STEEM has shown some strong support in its Square of 52, specifically with the nearest up-trending angle. With the aggregate market displaying strong divergences and STEEM displaying some of the most blatant examples of that bullish divergence, we can expect to see some heavy drives higher. There is some small resistance ahead due to the confluence of multiple momentum lines, but the current channel should hold. One of the most fun charts to observe here is the IOTA/USD chart. Within its own Square of 52 construction, we see that price is not only in a great expansion zone, but the next one above is massive. Even better, the zone below us is a very tight zone, providing little risk. Structurally this is one of the best geometric setups (if not the best) for today. 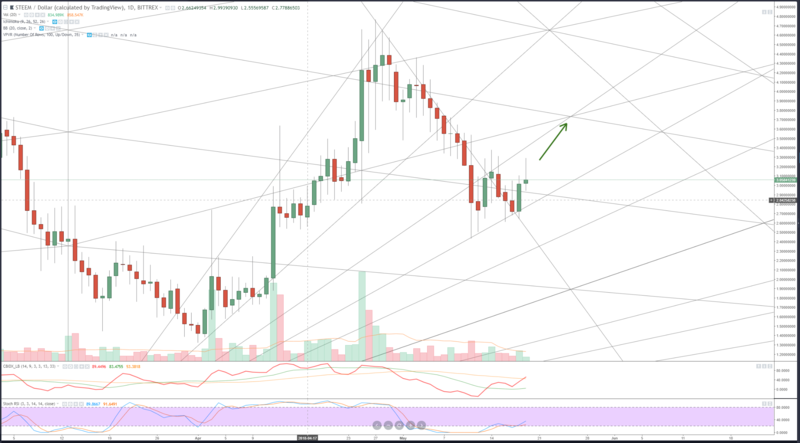 Similar to IOTA (in more ways than just this chart), we see two large expansion zones above. Where it differs is that EOS is currently ready to break out of its right expansion zone and ready to burst towards two open and bullish expansions. A fantastic early setup here. Finally, I can’t do a signal post without one of the majors. 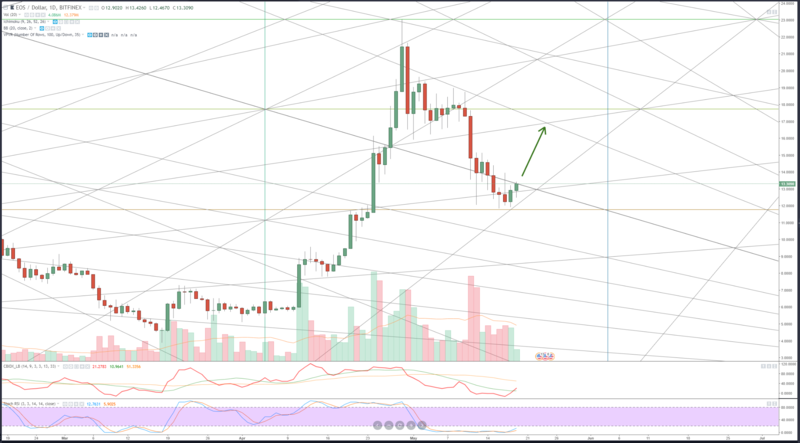 Ethereum is just one of the major pairs right now with a very clear picture and roadmap in its market geometry. Significant 3rd motive wave expansion coming off of a double bottom and a held support angle.